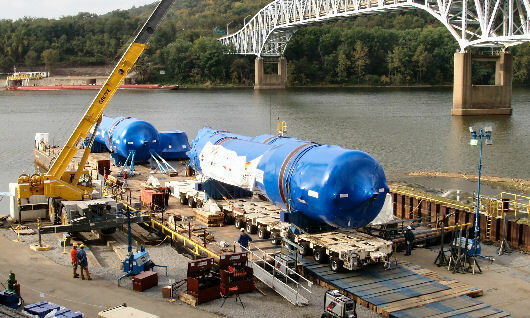 In October 2005, the Beaver Valley Power Station replacement steam generators and reactor head were delivered by heavy lift barge PAUL BUNYAN and offloaded upon arrival at a special slip in Shippingport, PA. The barge was carefully ballasted down and grounded. Hydraulic multi-wheel trailers were rolled onboard and each 350 t heavy generator was rolled off and moved to the power plant for installation. Lastly, the 60 t heavy reactor head was rolled off. Argonautics Marine Engineering, Inc. was hired to provide detailed procedures for mooring, pre-ballasting and grounding the barge including maintaining adequate and safe bottom reaction throughout the four roll-off operations. Photographs courtesy of Rigging International, Inc.